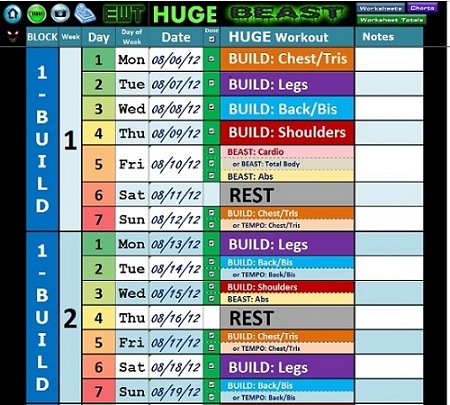 Excel Spreadsheet & Workout Manager for Sagi Kalev's Super Beachbody Muscle Building Program Body Beast! Includes BONUS Nutrition Spreadsheet. This Sets Up All The Other Pages & Worksheets. and You Can Then Check Off Your Completed Workouts. Current Days Workout Date Will Be High-lighted in GREEN. Your Checks for Completed Workouts, Will turn GREEN As Well. You Will Also, Come Back Here At The End to Insert Your After Photos. In The Measurements Tracker Page. Your Ending Body Stats Achievements. We Have ALL the Worksheets. Band Color, Notes and More. We Have ALL the Charts. Get a visual view of your Progress. Calories Allowed For Each Phase, Auto-Calculated. This program was created with MS Excel 2010 and saved as both a Excel 97-2003 template, and an Excel 2007-2010 template. Also, Mac 2004 & Mac 2008+ Folders are Included. Save yourself any spreadsheet creation headaches and Countless Wasted Hours because we have done it all for you. The file Works with Windows MS Excel 2000-2010. THE PROGRAM DOES NOT CONTAIN ANY MACROS OR VISUAL BASIC CODE. Just check out all the screenshots, and if this is something you can use we will provide any support you need. (Due to different versions of Excel, Monitor Sizes, Resolution Settings, and Graphic Cards, the screen colors and screen fit, may not Be exactly as shown. What you see is how it looks on our screen. This gives you an idea of what is included in the program and what it looks like. If you ever lose or accidentally mess up a template, just let us know and we will send you another one. Excel Workout Tools is the creator of this product. You have permission to modify the program for your own personal use, but No resale or pass along rights are granted. You can install it on as many computers as you need to, as long as it is for use by you or your immediate family. 30 Day Money Back Guarantee. If you are not happy, let us know within 30 days and we will refund 100% of your money. Thanks a lot and get yourself commited. Body Beast is a registered trademark of Product Partners, LLC LTD LIAB CO CALIFORNIA. We are not affiliated with Product Partners, Body Beast ®, Beachbody.com ®, or Sagi Kalev. No Product Partners, Beachbody ®, Beachbody.com ®, or Sagi Kalev trademarks, or logos, appear anywhere in the spreadsheets. No copyrighted materials of Product Partners, Beachbody ®, Beachbody.com ®, or Sagi Kalev are included in any of the downloads. This Excel Workout Tool is a third-party tool and is not officially written by, endorsed by, or supported by Product Partners, Beachbody ®, Beachbody.com ®, or Sagi Kalev. This Excel Workout Tool was created to help you get the most out of your workouts with the above mentioned program.